This post was first published by The Croydonist on 14/03/2019. Change starts with an idea. And one particular idea happened back in July 2007 when Croydon teenager Eliza Rebeiro started a campaign with a statement printed boldly on a T-shirt. The statement read LIVES NOT KNIVES. The number of teenagers being stabbed due to youth crime and gang culture had taken its toll on her and her friends, so she felt something needed to be done. Soon people were asking to buy the T-shirts so more were produced and sold. They had enough funds to organise an event, which became a celebration of young people having fun, without violence. All 150 attendees signed a petition to make their streets safe. That campaign became a charity, working to prevent knife crime, serious youth violence and anti social behaviour, as well as supporting young people most in need into education, employment and training. Now nearly 12 years on from Eliza’s T-shirts, the role of Lives Not Knives (LNK) is more important than ever, when we live in a society where knife crime is on the increase. Everything the charity does to tackle knife crime is about prevention. Their mission is to make youth violence education mandatory in schools, thus raising awareness and creating positive change. We caught up with Eliza to hear more about the charity’s journey. Some of the LNK team outside their office space in Centrale Shopping Centre. Eliza, second from right. Photo courtesy of LNK. Croydonist: First of all, Croydon native or convert? Eliza: Croydon has been the home of LNK for over 10 years. Myself and most of the team, bar one, were born and bred here. Croydonist: You founded LNK when you were only 14. How did you learn to run a charity at such a young age? Eliza: I didn’t, not on my own anyway, I have an amazing mum and grandma who helped and supported me through a tough time which then led to the growth of LNK. Croydonist: Why did you start the LNK campaign? 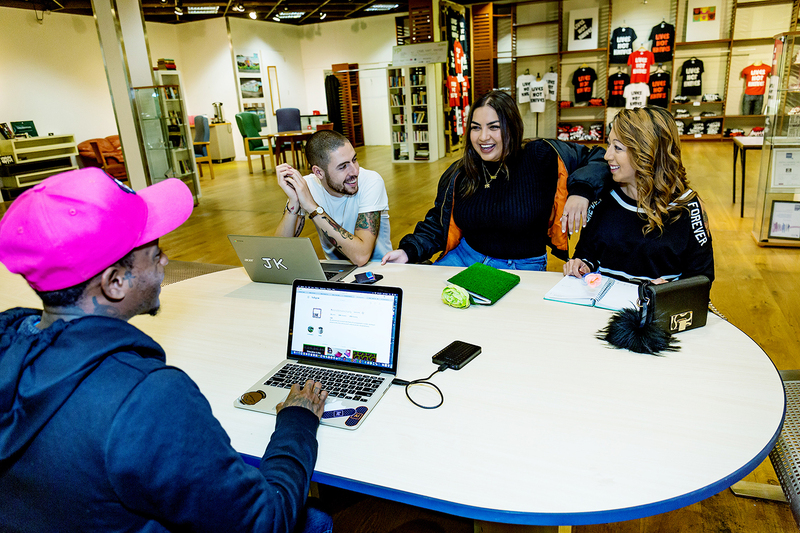 Eliza: The campaign initially started to raise a voice for young people and prove that not all young people were part of the media’s ‘asbo generation’ and that a lot of young people were against knife crime. It started with the LNK T-Shirt and to prove youth could have fun and enjoy their lives without violence. 10+ years later we are still pushing to help young people be their best selves. Some of the LNK team working in their office space. Eliza, second from right. Photo courtesy of LNK. Croydonist: What are LNK’s greatest achievements over the last decade? Eliza: LNK have been awarded a Phillip Lawrence award and a Princess Diana award for the work in schools as dedication to education on youth violence. We have worked in schools delivering LNK roadshows to over 50,000 young people, given 1 on 1 support and mentoring to over 300 young people from Pupil Referral Units or at risk of exclusion, and provided youth work apprenticeships for 8 young Croydoners. Croydonist: What is the charity focussing on this year? Eliza: LNK will be delivering Teachers training to a number of schools in London. The training will go through knife crime and youth violence, how to talk about it and what to be aware of in schools. It also gives teachers videos and lesson plans to use to teach about these issues in PSHE, citizenship and form times. We want youth violence education to be mandatory so young people are aware of their rights, the dangers of knife crime and how knife crime affects communities. Thank you to Eliza for chatting to the Croydonist. 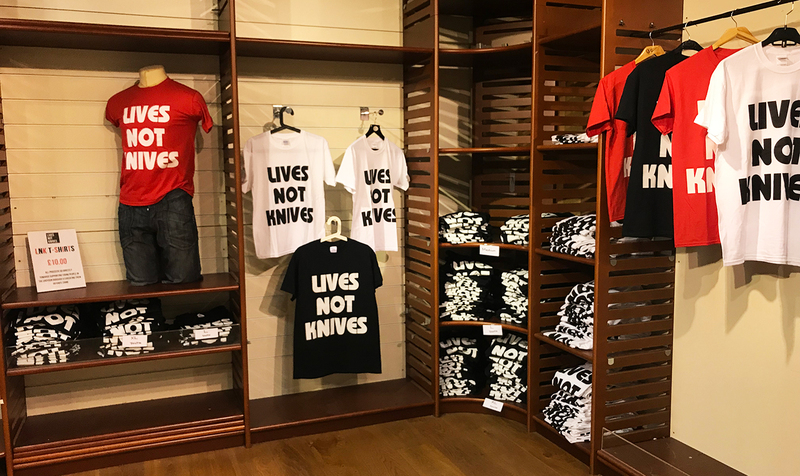 If you want to get involved you can donate directly to Lives Not Knives here, or buy one of their T-shirts here. Lives Not Knives is our charity partner for our music festival Cro Cro Land, which takes place on 6 April. £1 from each ticket sale will be donated to the charity and we are also collaborating with LNK on a youth mentoring programme to give young people an insight into career paths in the music industry. You can buy tickets to Cro Cro Land here.